Finally blessed with a bit of time to peruse ESPN’s compelling financial stats as presented in its magazine’s “All About the Money” issue (check them out if you haven’t already; big numbers are fun! ), BallinEurope just couldn’t help, well … noodling around with the numbers some more! In the amazing “Best-paid athletes from 182 countries” list, a neat 11 European basketballeros make the cut (though included are slight stretches in Mickael Pietrus, who represents Guadeloupe but plays for Team France in FIBA competition, and Team Britain’s Luol Deng, listed under Sudan). Ten of these 11 draw their salaries from NBA teams and are joined by Theo Papaloukas, who becomes not only one of the greatest never to play in America’s league but also one of the highest-paid non-NBA players ever by earning his Euros with Olympiacos. Pau Gasol isn’t even on the list?? Gabe: Pau Gasol isn’t even on the list?? Ever hear of a little sport called football (or soccer for you since you don’t even know what it is)? Yeah, keep up the good work fullfilling all the stereotypes on Americans here Gabe. Ummm I don’t know what soccer has to do with a list of the ten most paid European basketball players??? the point is that this is a list of the highest paid athletes from each country. Os D. just extracted the basketball players from the list. Pau G. isn’t on the list because he doesn’t make as much money as the top soccer stars from Spain. 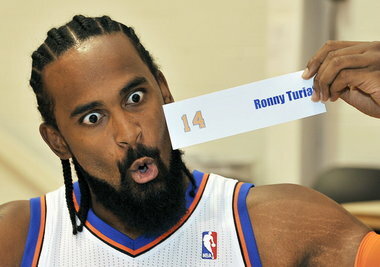 The joke about Noah is that Turiaf — and not Noah — is the highest paid Frenchman (until next year, when Noah’s extension kicks in). ^– Ever hear of a little sport called auto racing (or racing for you because it is just another word for the same sport)?